Torpedoes struck West Virginia, California, Oklahoma, Arizona, and Nevada battleships, as well as destroyed hangars and aircrafts. A second attack of Pearl Harbor came about 30 minutes later, while Japanese fighters and dive-bombers struck other bases and airfields around O’ahu. In about two hours, the Japanese significantly weakened the U.S. Pacific presence, killed over 2,500 people, and thrust the country into WWII. O’ahu attracts countless visitors per year and is known for its picturesque landscape, stunning turquoise waters, vibrant city of Honolulu, famous Waikiki Beach, and spirit of aloha. 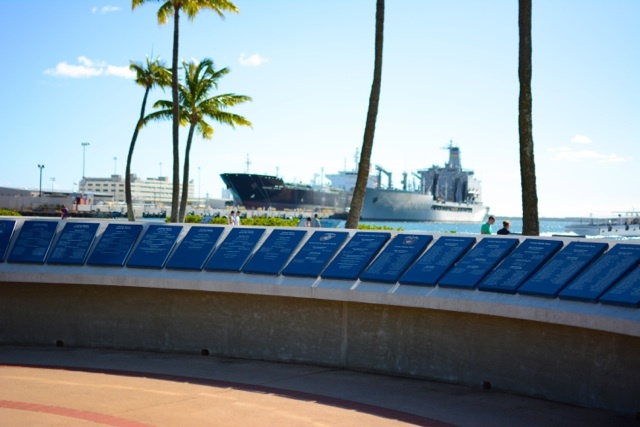 All of these attributes make the island special, but a trip to O’ahu would be incomplete without visiting Pearl Harbor. 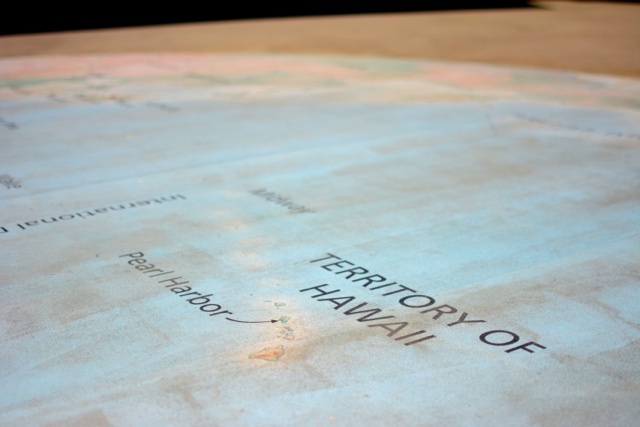 Located 45 minutes west of Waikiki, off Highway 99, Pearl Harbor is next to the U.S. Naval Base. It’s open daily from 7:00 am until 5:00 pm, with the last program starting at 3:00 pm. 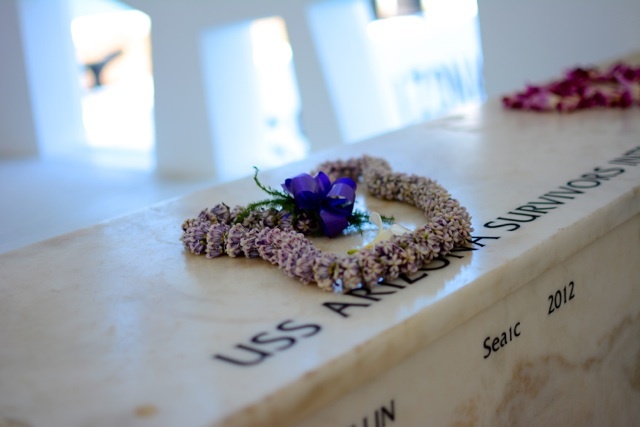 Tickets for the USS Arizona Memorial interpretive program can be found at the visitor center’s Aloha Court on a first-come, first-served basis. This program includes a 23-minute film in the Pearl Harbor Memorial Theater and then a U.S. Naval boat shuttles visitors to the USS Arizona Memorial. The program takes approximately 75 minutes. Half and full day tours, as well as tickets to the USS Bowfin, battleship Missouri, and the Pacific Aviation Museum can also be purchased. To fully comprehend the history and magnitude of the bombing of Pearl Harbor and its place in American history, I’d recommend renting the audio tour narrated by actress, Jamie Lee Curtis. It’s available for $7.50 in English, Mandarin, German, Korean, Spanish, French, and Japanese. A map guides visitors around the park, while corresponding numbers on plaques are keyed into the headset to trigger the narration. 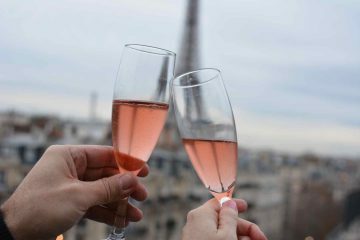 The tour can be completed in any order and at your leisure. I found the most interesting aspect of my visit to be the Road to War and the Attack Museums. In the Road to War Museum, visitors learn about the events that led to the war with the U.S. and Japan through items such USS Arizona and the IMS Akagi models, a letter from President Franklin Delano Roosevelt, and video of a WWII Japanese code breaker describing the process. 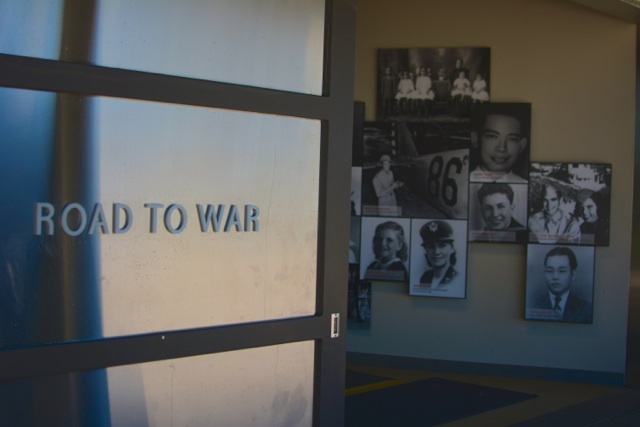 The Attack Museum is dedicated to December 7, 1941 and the attack on Pearl Harbor. There are remnants of the USS Arizona and one of the torpedoes that struck the ship, as well as a 1/3 scale Japanese B5N2 “Kate” torpedo bomber. Every fifteen minutes in the museum’s theater the movie, Battlefield-O’ahu, is played. Survivors also can be heard recounting memories from the attack. Perhaps the most solemn area of the park is the USS Arizona Memorial. The beautiful white memorial is built directly over the sunken battleship where 1,177 Marines and sailors were killed. 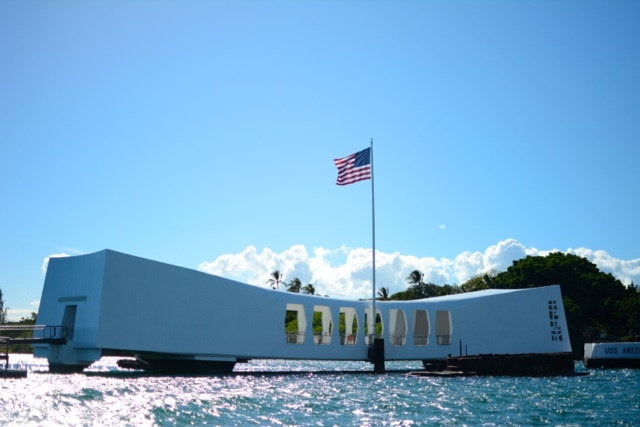 According to Pacific Historic Parks, the USS Arizona Memorial is the most visited destination in Hawaii. 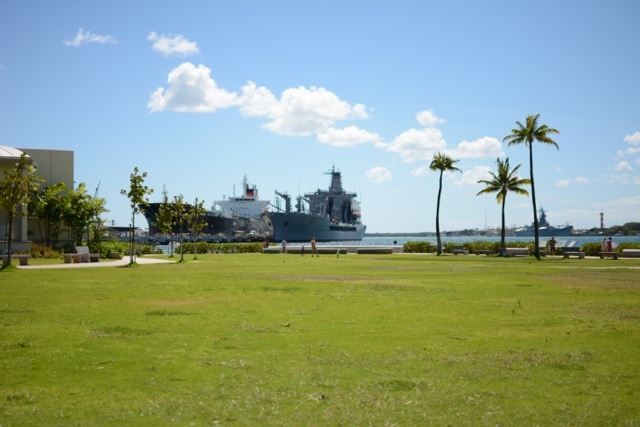 The park is not only a sad and chilling reminder of one of the darkest days in American history, but also a gravesite and a memorial to those lost in the attack on Pearl Harbor. 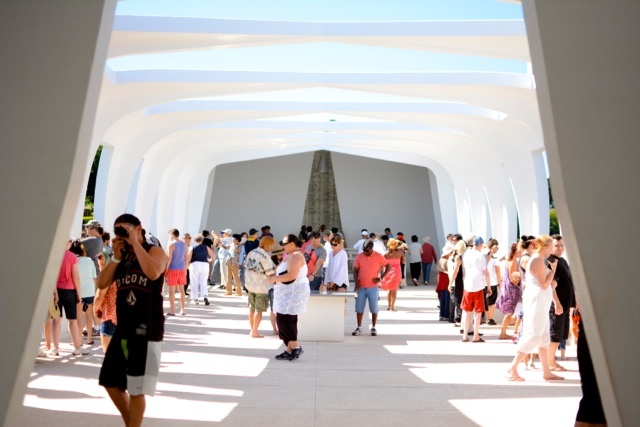 I saw people from various nationalities posing for silly photos with huge grins on their faces while on the USS Arizona Memorial as if it was just another tourist attraction. This angered and saddened me at the same time. Pieces of the battleship and oil in the water can still be seen, which are real reminders of the people buried below. When visiting the park, it’s very important to remember that many people lost their lives in the Japanese attack and proper respect and decorum should be shown. Time spent visiting Pearl Harbor should be one of reflection, education, and remembrance. 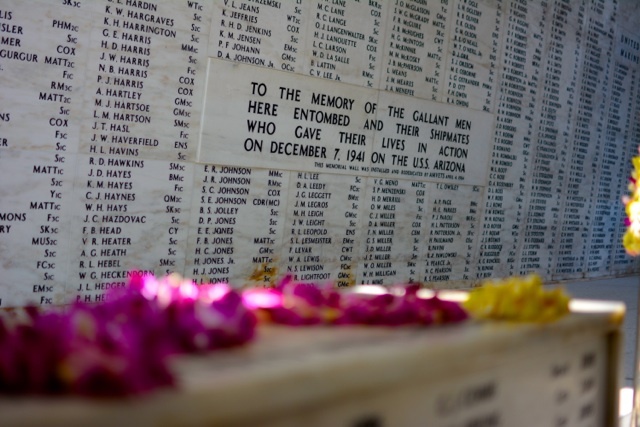 For more information on visiting Pearl Harbor, please see their Website. I was a guest of the O’ahu tourism board. In no way was I swayed to write a positive review by the friendly park rangers, the pristine park grounds, or the nationalistic pride I felt when visiting Pearl Harbor. As always, opinions are mine. Very interesting – but kills me when you see all the mass tourism at these places. You were right – how can ppl pose with a huge grin? The park itself is a very solemn place. It’s just ignorant people that don’t treat it with the respect deserving of what is essentially a big gravesite. I visited Pearl Harbour on a trip to Hawaii a few years ago and it was a remarkable experience to see the site, the memorial and learn more about this tragic day; there was a somber atmosphere when I visited, almost like being in a church…but then it was before Twitter and “selfies” became fashionable! Good point. Maybe it’s social media that has added to the mass photos. Or perhaps people just aren’t being taught how to behave these days. It’s sad, really. I would cherish an opportunity to visit Pearl Harbor. One of my greatest travel experiences was visiting the Normandy D-Day beaches. I devoured every World War II book and movie as a child and teen. My fascination with learning everything about that period led me to major in history. Unfortunately, not everyone grasps what happened at places like this. I hope those people laughing and having a good time at least learned something about the sailors, airmen and Marines who lost their lives in those waters. I think I’d really like to visit Normandy myself. 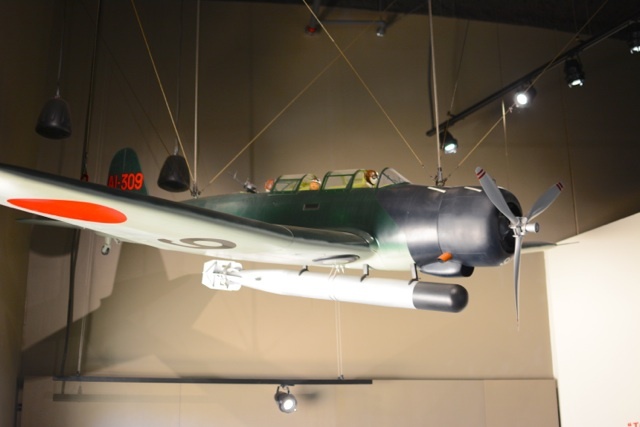 After visiting the WWII museum in New Orleans, I have a renewed fascination with that time period. We too had the opportunity to visit Pearl Harbor and it is indeed a somber reminder of a very dark day in our country’s history. I’m glad you had a chance to see Pearl Harbor. I think more Americans should have the honor. I agree with you about appropriate and respectful behaviour at a memorial; it just makes for good decent sense. At the Pearl Harbor memorial, I had a chill go through me when I looked down into the water and saw the ship remnant poking above the water’s surface; as I understand, there are people buried underneath in the water. I have another dream to visit sites where Canadians fought in World War 1 at notable places like Vimy Ridge, Ypres, and Passchendaele. Yes, part of the battleship is still visible, and yes, there are many military personnel buried beneath the surface. It’s a very sad place to visit. i’m glad you had the opportunity to visit. when the hubs & i were in oahu, we weren’t sure if we were going to have time, and since it’s first-come, first-serve, you need to book reservations, like, 6 months in advance. we just went and took a few pictures of the harbor and called it all day. i will say, though, that i was super disappointed by how much admission cost. if we had opted to do everything, it would have been over $40 per person. maybe i’m just used to dc where the monuments are free, but i don’t know. it felt excessive for something that, like you said, is for reflection & remembrance. I didn’t realize exactly how much it costs, but I certainly found it worth the price of admission. That does seem a bit steep though. I have only been to Hawaii once, and it wasn’t even a visit. Instead it was a seven hour layover where I left the airport in search of the beach and a little taxi tour of my own – with the cutest cab driver from Hong Kong. I must get back to the state and see more of it, including this. Great photos! 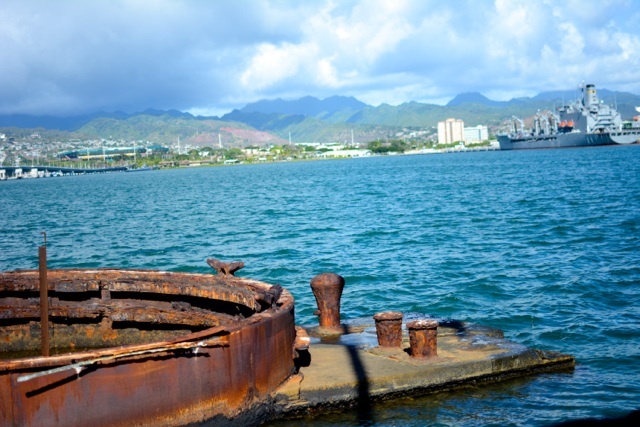 O’ahu is a great place to visit, and Pearl Harbor is just one of the reasons. Beautiful photos. I’ve visited the memorial once and it was a special moment. I’m glad you got a chance to see it. I’m sure that you studied a lot about WWII being from Poland. I bet it was interesting to see it from the American perspective. When I was touring Auschwitz I saw some Japanese taking pictures of each other in front of the displays showing all the hair and shoes taken from Jewish prisoners. At least they were solemn, but it was weird that they would want to pose in front of such chilling remnants of such horror. Pearl Harbor is definitely on my radar to visit if I ever get to Hawaii. I have visited quite a few World War II locations across the globe including Normandy, River Kwai, and Corregidor in the Philippines, so I would love to check it out sometime. OK, that Auschwitz story just boggles my mind. What are people thinking? I can’t believe people are there laughing and posing as if that is just a park. I hope to some day visit Pearl Harbor and pay my respects. Great write-up, Leah. Thank you, Raul. By the time I was leaving the park, I was absolutely fuming. I just wanted to shake each person and ask them if this behavior would be ok at one of their family’s grave site. I understand what you’re saying, but it really is amazing how far the USA and Japan have come in such little time. I can’t believe there was a time when this happened. It’s such a contrast to the beautiful beaches. Actually Pearl Harbor is beautiful, too. Had this tragic event not happened it would still be visited for the splendor. Lots of history to digest here. An entire day wouldn’t suffice. I remember visiting…so scenic and peaceful. Absolutely, Charu. Such a beautiful place with such a painful past. Actually there aren’t any signs, Craig. At least, none that I saw. Shame it would have to come to that. I am sure this would make for a surreal experience. Eerie, almost! That’s a good way to describe it–surreal, but especially saddening.